Inspire and motivate your students (or yourself!) 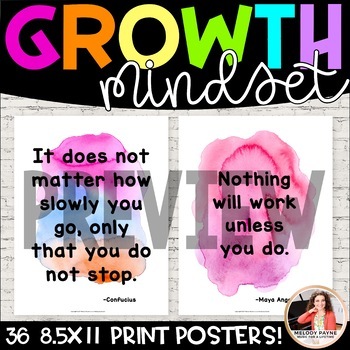 with these 36 8.5x11 watercolor growth mindset posters. 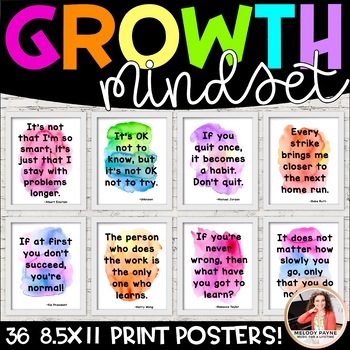 Imagine using these posters to contribute to your classroom decor! Hang them in your classroom, conference room, hallway, office, or studio for a tremendous effect! Looking for the EXTRA-LARGE 30x40 posters? Click here! 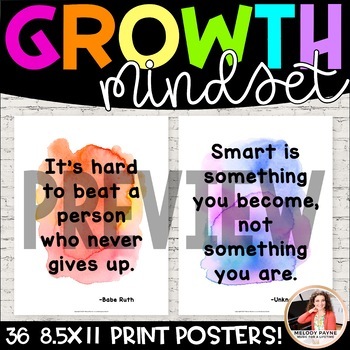 Looking for growth mindset posters with a beautiful script font? Click here! Sometimes there's not a better way. Sometimes there's only the hard way. Never give up. Have the passion. Don't be afraid. People with a growth mindset welcome setbacks with open arms. Smart is something you become, not something you are. It's OK to not know, but it's not OK to not try. It's OK not to know, but it's not OK not to try. The person who does the work is the only one who learns. I never lose: either I win, or I learn. It does not matter how slowly you go, only that you do not stop. If you quit once, it becomes a habit. Don't quit. Action is the foundation of all success. If at first you don't succeed, you're normal! I haven't failed, I've just found 10,000 ways that won't work. All of our dreams can come true - if we have the courage to pursue them. Don't tell me how talented you are. Tell me how hard you work. If you're never wrong, then what have you got to learn? Click the PREVIEW button for a peek at all of the posters. I prefer to print mine onto glossy photo paper using the best print setting. This really makes the colors stand out. However, they look really nice printed on regular paper or card stock. Picture how beautiful they will look in your classroom! Purchasing this item grants you a SINGLE USER LICENSE for use by a single teacher. Purchase multiple licenses for multiple users at checkout. Not for commercial use. Copyright © 2016 Melody Payne. All rights reserved. Leaving thoughtful feedback helps you earn TpT credits to spend! I'd love to hear how much you and your students are enjoying these items, and other buyers benefit from reading your feedback, so please leave a few kind words and a super rating below. Thank you! Having trouble with a file? Leave a question on the Q&A tab or submit a support ticket before leaving feedback. Click here for more watercolor products! 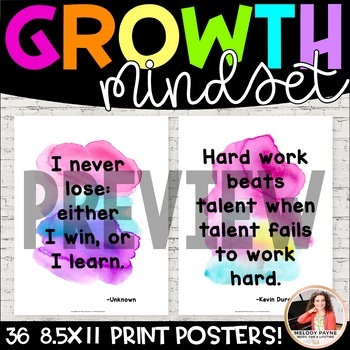 Click here for more growth mindset items!